You wrote, “Imagine, for one moment, a similar setup for women’s clothing. Salespeople armed with tape measures, and a directed, two-point measurement scale that helps you find the size that’s best for your body.” I am drooling at the thought. But our bodies are so different and more complex than men’s. If I know everything there was to know about tailoring and sewing, I’d give it a go to figure out how to do this. I’d love to build the business model and make every woman look as good as she wants to be in the clothes she likes. And watch men drool! Sigh. Do you think they are really more complex than men’s? I watched so many different men trying things on, I suspect it’s more the fashion than the bodies. Men come in all the same variations women do: chubby, short, long-waisted and stoop-shouldered, etc…but the clothing is simplified: pants, shirt, jacket, and sometimes a vest, with some pretty standard shapes. That’s my theory, anyway…it’s the clothes, not the bodies. Julie, it’s funny but I thought about that during the day yesterday and have to agree with you. I kept thinking why would they tell you they CAN alter women’s clothes but don’t want to? What is it about women’s clothes that would make them say that? And I realized it’s the clothes. Our outfits are way more complex than shirts and pants. I want to have a sewing business and it’s been suggested to me — by a very well-to-do man — that I should make men’s clothes. Men are more used to custom made clothes and paying thousands for suits. Even though I should be thinking about the business end of it, that wouldn’t be any fun to me. I love to sew and want to make beautiful things. That’s another factor that favors “it’s the clothes.” 🙂 You’re right. I think I would pay more for clothes if it fit right/was tailored to my body, and if I knew it wasn’t going to be hopelessly out of style in a season or two. But since trends do swing so wildly for women (compared to men) it’s just not worth the investment. Hmmmm, now I have to think about ways to work *this* realization into my personal style, as well. Quite so – although I have to say I’m drooling over the idea of fitted women’s clothing myself. I worked in the costume shop for my high school theatre, and the suits have been essentially the same since the 1800s. The only thing that’s really different to the general observer for a suit jacket is the frock coat of the late 1800s and early 1900s, which is basically a regular suit jacket, but more fitted and longer in the back. Otherwise, the only adjustments have been the width of the lapel, where the button falls, and how many buttons there are. 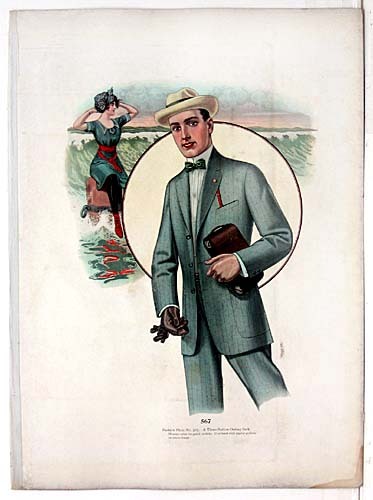 A man could theoretically wear a suit today from 1900 and look just a little off. Whereas women’s clothing… the hemline alone jumps violently up and down annually, let alone by the decade. Costuming for men is easier.